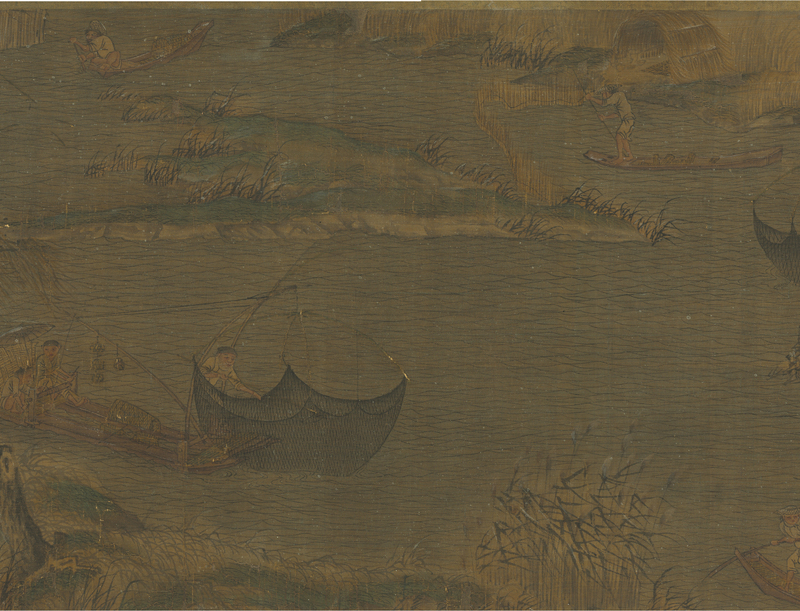 This handscroll painting combines a vivid description of figures with a landscape as it unfolds from right to left. 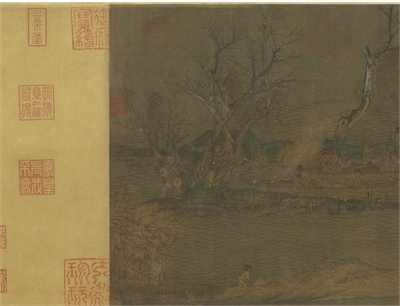 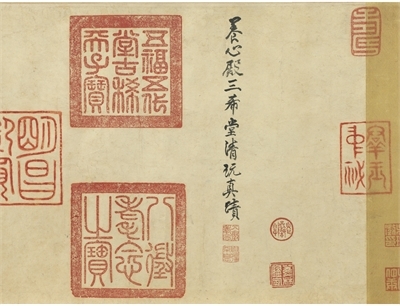 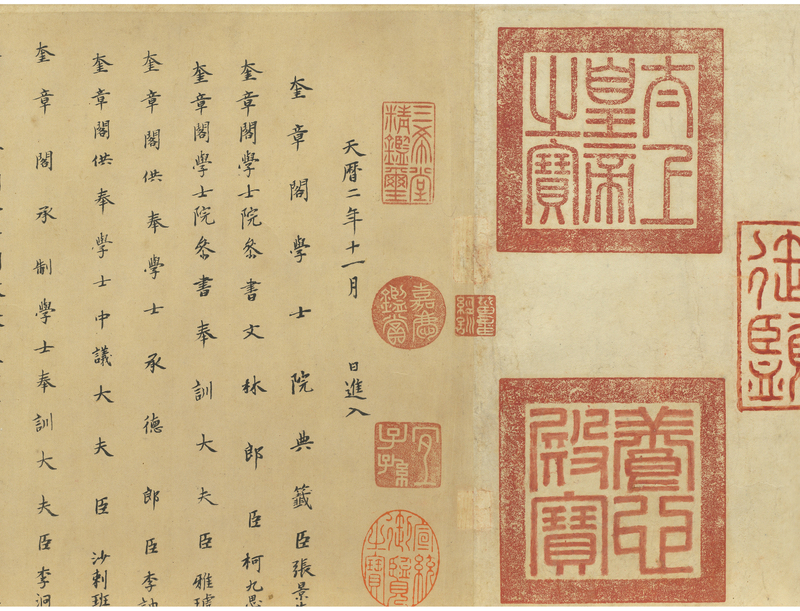 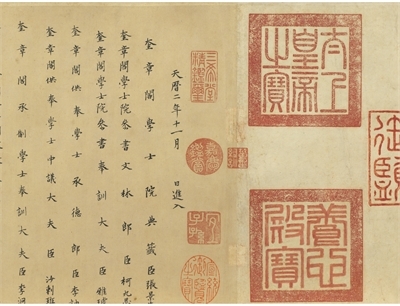 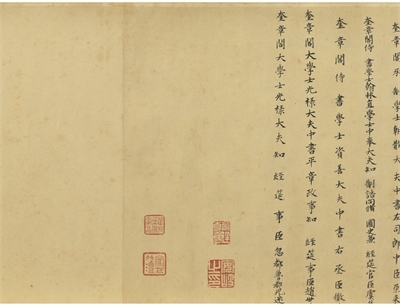 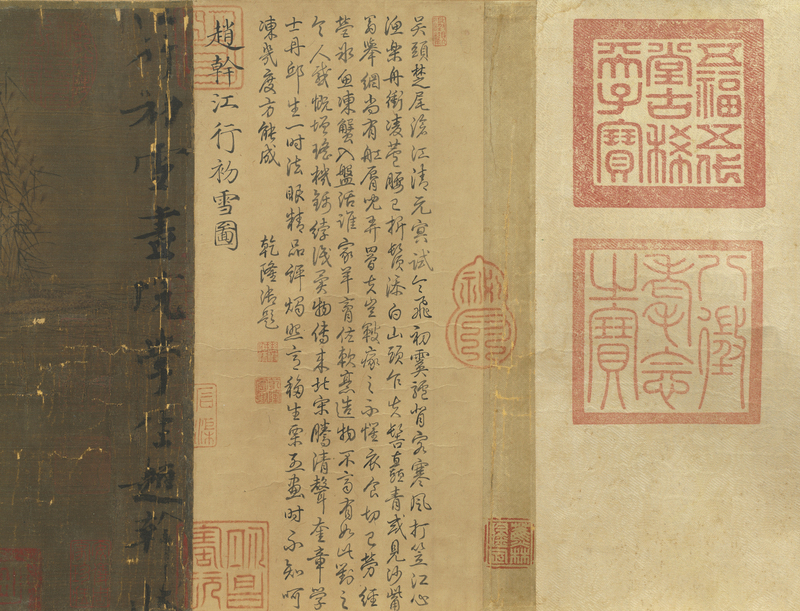 At the very beginning to the right is an inscription by the Southern T'ang emperor Li Yü (r. 961-975) that reads, "Early Snow on the River by Student Chao K'an of the Southern T'ang," providing contemporary proof of both the title and artist. 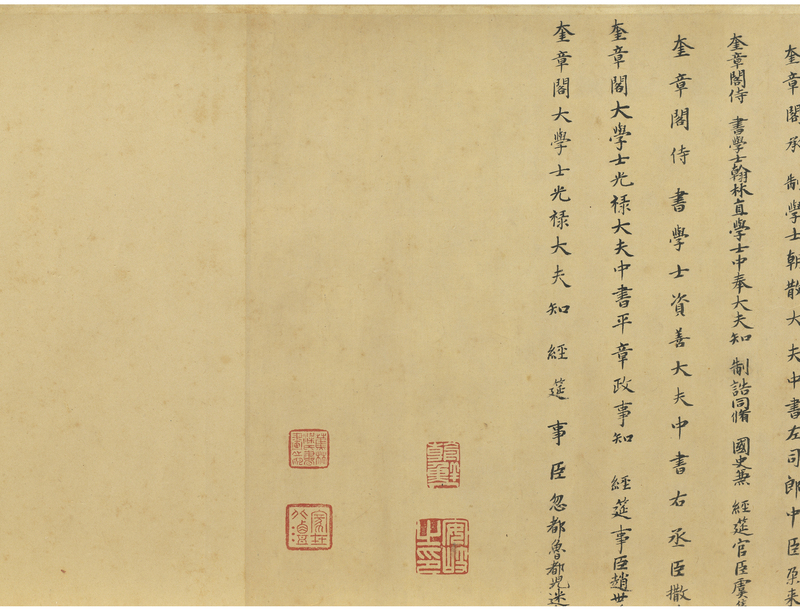 Chao K'an was a native of Kiangsu province who spent his whole life in the southeastern area of Kiangnan. 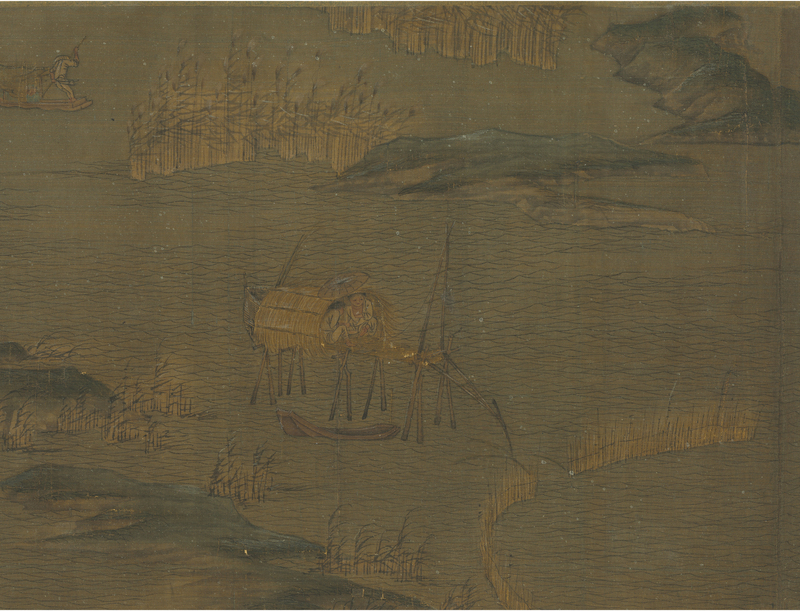 Not surprisingly, most of his landscape paintings present the lush and water-filled scenery of that area. 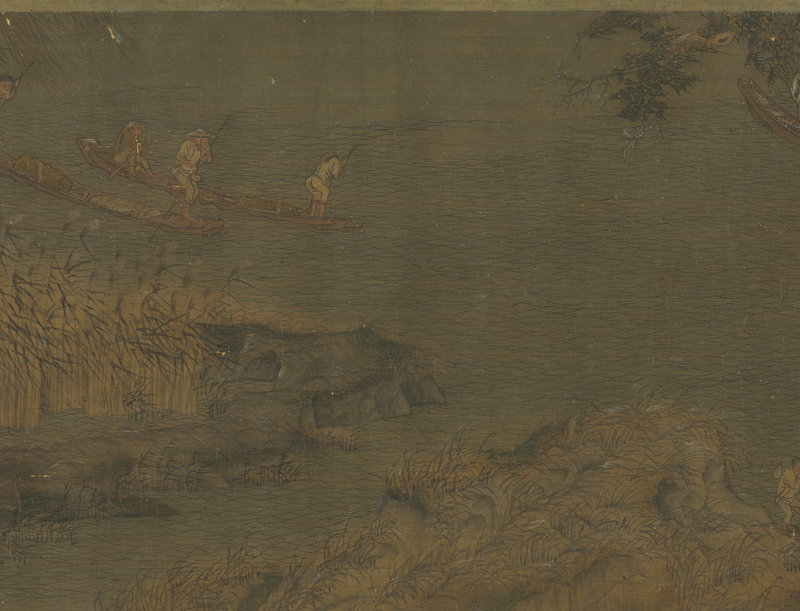 As a handscroll, unrolling this work literally unfolds the life and activities of fishermen along isolated river inlets. 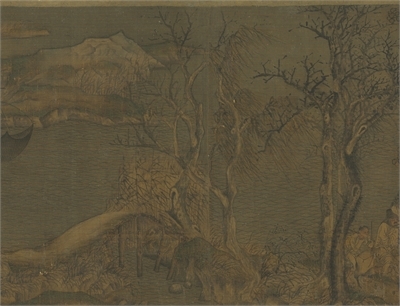 The bare trees and dry reeds show that the season indeed is winter. 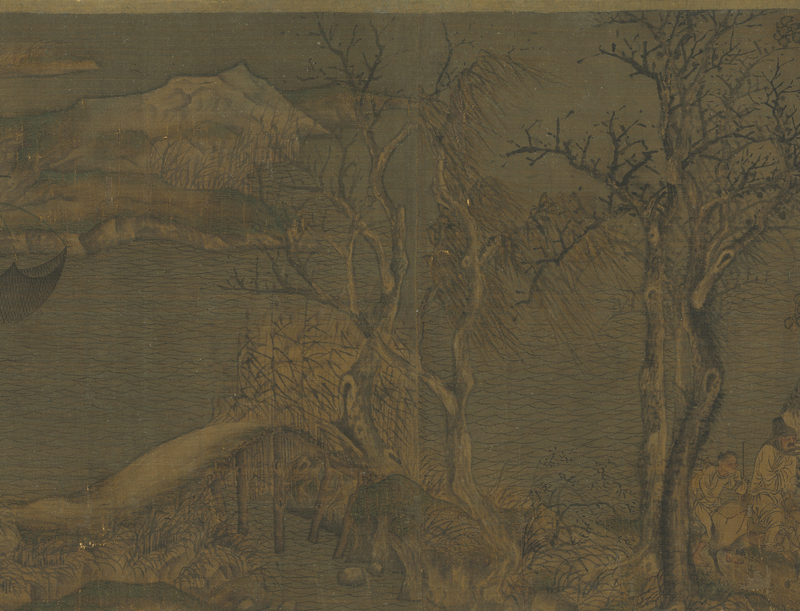 The artist Chao K'an paid so much attention to detail that he even sprayed dots of white pigment to illustrate the first wind-driven flakes of snow. 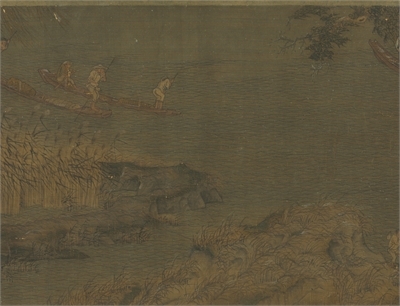 About one third of the way from the beginning is a group of travelers as they make their way along the riverbank. 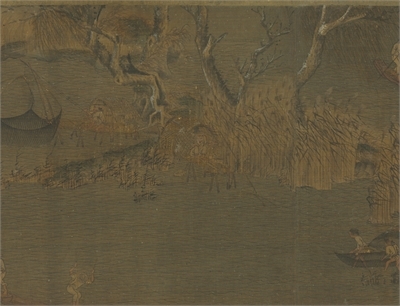 The expressions of the figures--even the mules--reveals just how cold and harsh the wind is at their back. 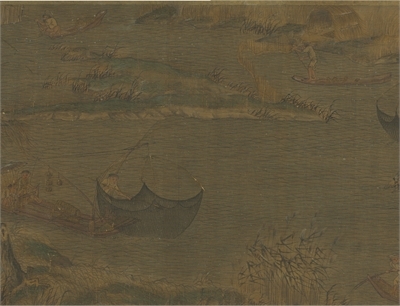 In terms of technique, Chao K'an filled almost the entire scroll with washes of ink and color. 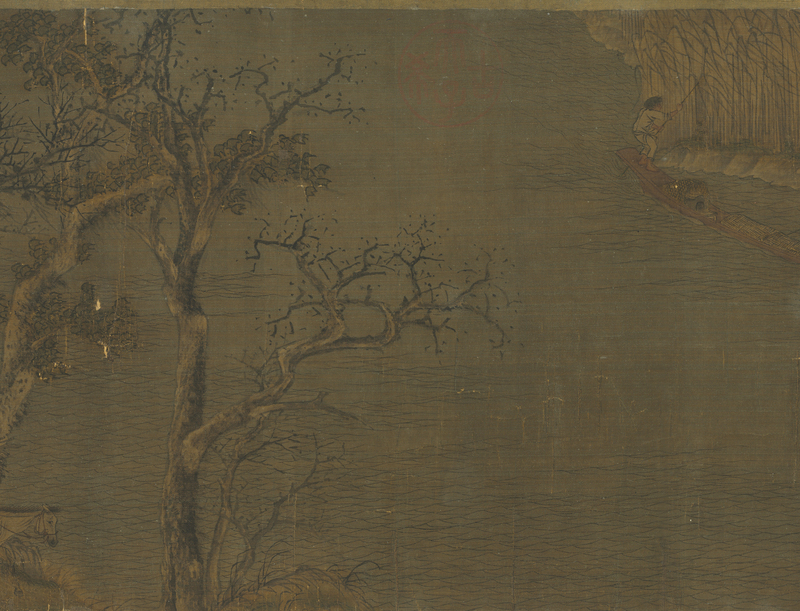 His centered strokes outlining the bare trees appear as strong as twisted iron. 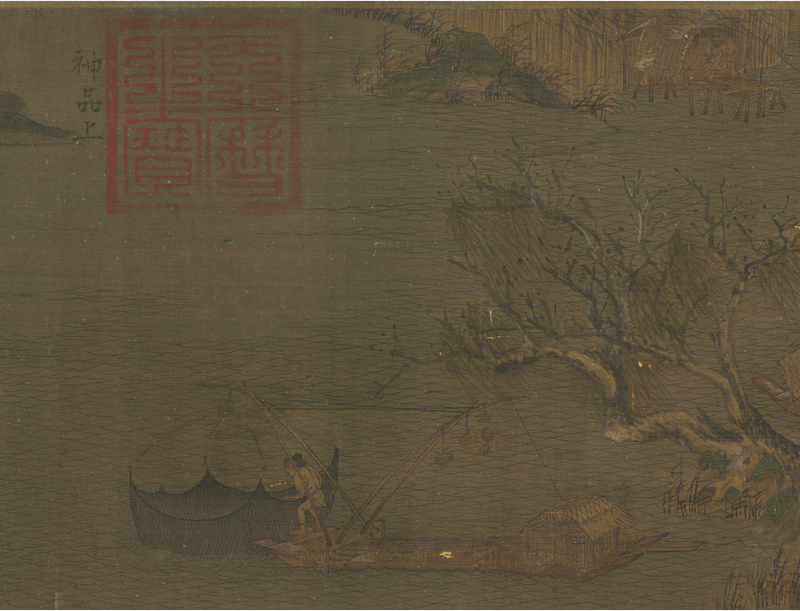 The trunks were then delineated with washes and dry strokes similar to what later became known as "texture strokes" in Chinese painting. 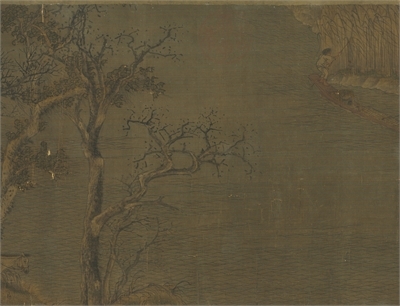 The effect is that of light and dark, providing for a sense of volume. 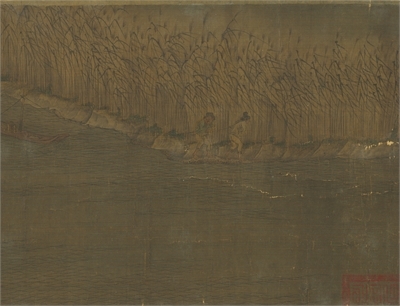 Chao rendered the reeds bending in the wind with single flicks of the brush. 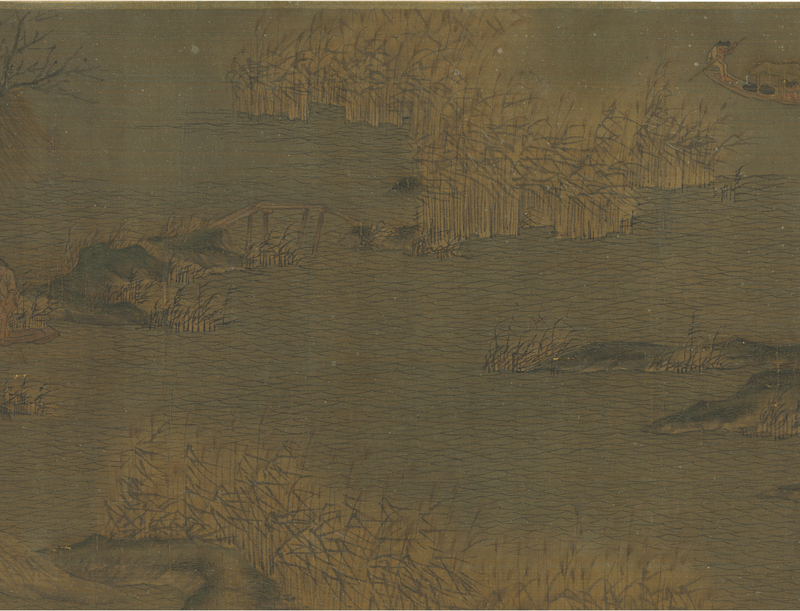 He also modeled the landforms but didn't use formulaic texture strokes, makes this work look much different from later landscape paintings. 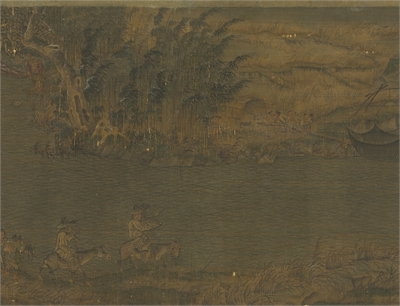 Judging from the seal impressions, this masterpiece of early landscape painting was treasured in private and imperial collections from the Sung (960-1279) up to the Ch'ing dynasty (1644-1911).